ON THIS DATE (June 24, 1984) ... The Red Sox nailed a 5-3 victory in 10 innings over the Toronto Blue Jays. Tony Armas' two-run homer off Dennis Lamp in the 10th inning was the game-winner and gave Boston a 2-2 split in the series. Armas' home run, however, was only the final payment to the Red Sox account, which had been overdrawn as the Red Sox had lost nine of their previous 10 games. His dramatic battle at the plate against Lamp, against whom he fouled off several tough pitches, would have meant nothing without the ninth-inning contributions of pinch hitter Reid Nichols. With two outs and the bases loaded in the ninth, the Sox were one strike away from a 3-0 loss to Dave Stieb, the Blue Jays' ace. But Nichols foiled him with a classic Wall-banger, a double off the first right-hander Nichols has faced since May 15th. The ball barely scraped the Green Monster, hitting about eight feet above the playing field. By the time George Bell retrieved it, three runs had scored. But then, neither Nichols nor Armas would have been heroes, had not reliever Bob Stanley suddenly regained his groove and pitched out of two jams that thwarted Blue Jay scoring bids. With two men on and one out in the ninth, Stanley struck out tough Lloyd Moseby and then fanned Bell. With one out in the 10th, the Blue Jays had runners on first and second via walks. But quicker than you can say "vulture," Stanley picked Rick Leach off second and got pinch hitter Rance Mulliniks to ground to second. For eight innings, Ralph Houk was doing more praying than gambling for his Red Sox. Stieb had been outstanding, allowing only three hits, and none after the third inning. By the eighth, most of the 32,521 spectators were making for the parking lots and T stations because for two weeks Boston has been horrible in these late-game situations. But in the ninth inning, the magic in Houk's lineup finally materialized with simple execution and team offense. With Boston needing three runs, both Mike Easler and Bill Buckner came through with singles off Stieb. Rich Gedman popped up, but then Stieb loaded the bases by walking pinch hitter Rick Miller. Nichols fell behind in the count 1-2, then connected. Then it was Stanley's turn, and he made up for his own mess with a pickoff. Leach had walked and been sacrificed to second. But then, after walking Willie Upshaw and facing Mulliniks, Stanley threw a strike to second base and shortstop Glenn Hoffman made the tag. 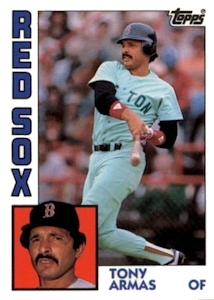 A stolen base by Dwight Evans was the key to the 10th-inning comeback by Boston. He had singled to lead off the inning and made his break with one out. Armas' at-bat was a classic. Lamp threw 10 pitches, most of them breaking balls, and he kept fouling them off until he hit his 19th home run of the year.